~~Mission Operations Lapel Pin The Mission Operations Directorate emblem was developed for the mission control team to recognize their unique contribution to the manned space program. 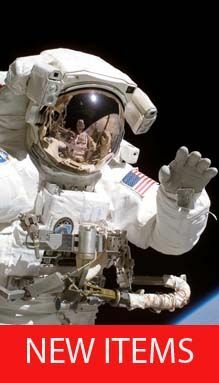 The original emblem was designed by Robert T. McCall in April 1973. In late 1983, the decision was made to retain all of the elements of the original patch and update it to support the Shuttle program. 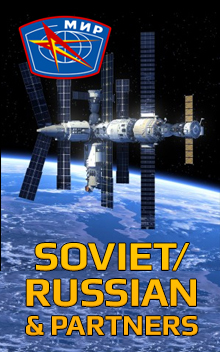 A further revision was made in late 2004, with the artistic help of graphic designer Mike Okuda, to incorporate the International Space Station into the design to recognize the achievements and contributions of the team supporting that program. Honoring the Past, Present, and Future The Mission Operations emblem as depicted in the current version incorporates or retains elements that honor Mission Control's past achievements, present commitments, and places an eye toward the future. The following summarizes the significant features for each: At the top of the emblem, the Moon and Mars represent the future. It is taken as a given that mankind will one day spread into the heavens, and these elements remind of Mission Control's intent to lead the way. 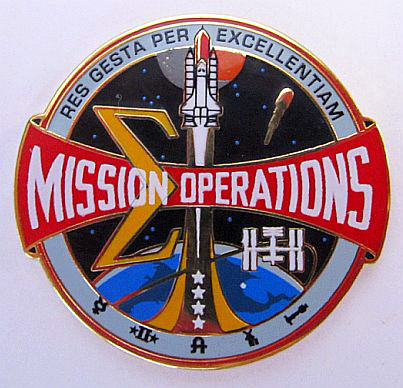 The wording RES GESTA PER EXCELLENTIAM on the patch were chosen to stress the very positive attitude used by the mission control team to assure crew safety and mission success. "Achieve through Excellence" is the standard for their work. It represents an individual's commitment to a belief, to craftsmanship, and to perseverance.